Fair warning. This is long. I have a lot I need to record, so bear with me. And meet me here Thursday if you’d rather talk about vegetables. 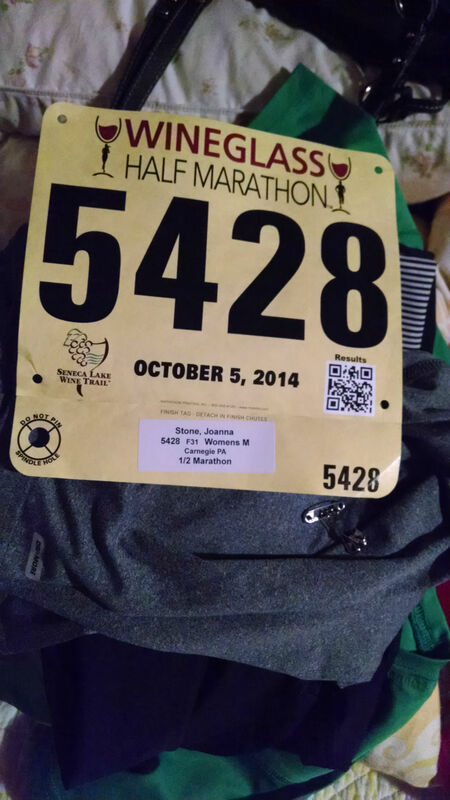 On Sunday, October 19, I became a marathoner. 26.2 miles for the first time. 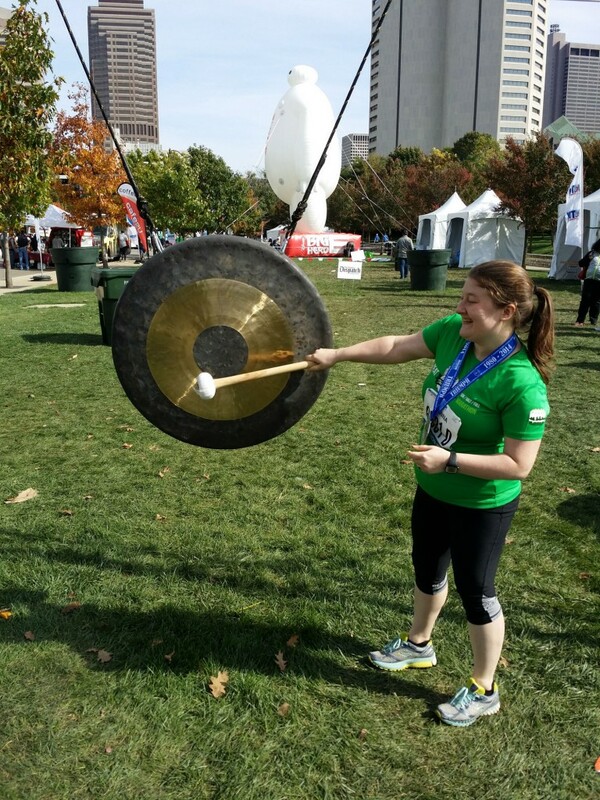 Now I know why people say they have a hard time describing the marathon experience. If you pick one select moment, you think “I was on top of the world” and if you pick another, you think “that was complete and total agony.” So which is it? Both. It felt like everything all at once – joy, pain, despair, happiness, agony, and triumph. 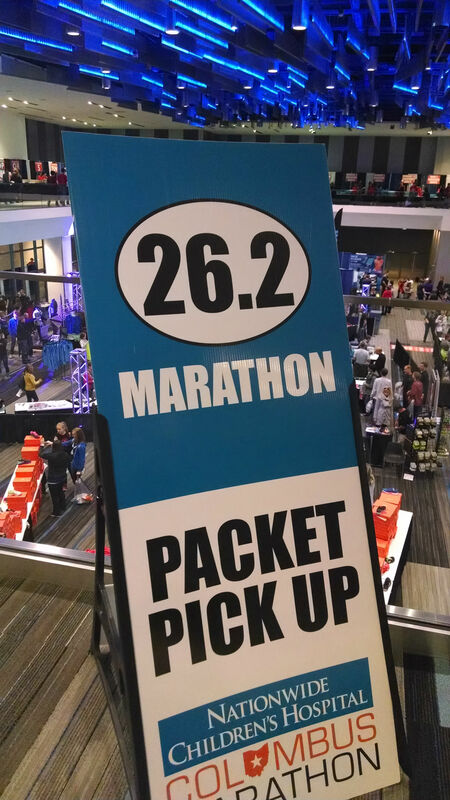 I came in to marathon weekend feeling pretty overwhelmed. I was sick earlier in the week and spent a morning in the ER, nearly in tears because I was terrified they’d tell me I couldn’t run. On Friday, the night before we were supposed to leave for Columbus, Vader got sick and had to go to the emergency vet. Thankfully he was better enough in the morning that we were able to go, and some wonderful friends checked in on him throughout the weekend. We made it to Columbus for the expo on Saturday, and I had my first overwhelming moment when I saw this sign. I was, as Mark would say, verklempt. And also, sort of nauseated, to tell the truth. Everything about the expo was well organized – and they even had a Goodwill section where people could buy “throw-off” clothes to have at the start line to keep warm. I had already made a Goodwill run earlier in the week, but that was a fantastic idea. Also at the expo, I picked up a couple of presents for myself. Yep, that’s a Christmas ornament. Mark and I will often get Christmas ornaments when we travel, to help remember our trips. I figured this was worth memorializing too. 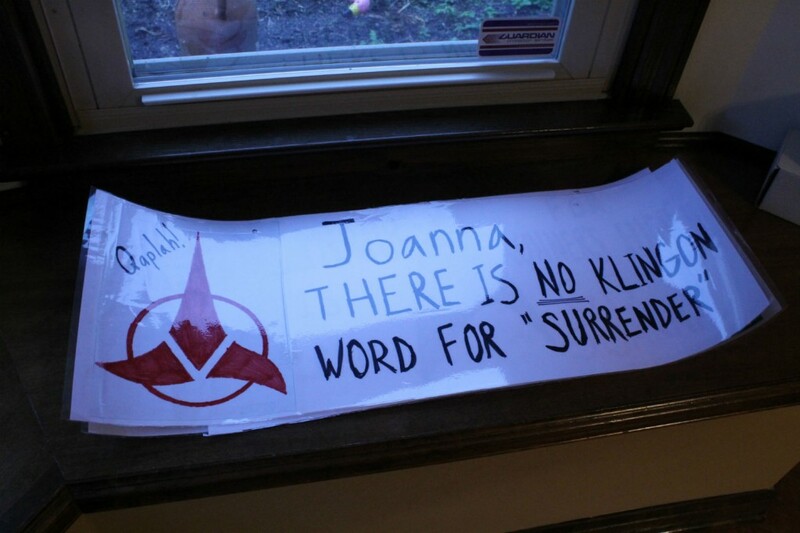 The tank is also incredibly comfortable (and ended up being somewhat prophetic, actually). Saturday night, we met up with our friends who were running the full and half and spectating for carb overload. We had great sushi at a place called Akai Hana, and followed it up with a singular beer and some pizza back at the hotel. I’ve found that the sushi/pizza/one beer combo is best for my carb loading because it doesn’t upset my stomach too heavily. I will probably do that combo for my next longer race, for sure. I had a decent night’s sleep for the night before my first marathon, but when my hydration alarm went off at early o’clock, I couldn’t fall back to sleep after I drank all my tea. (I drink a lightly caffeinated green tea before long runs. Works for me somehow.) So I laid in bed and tried to visualize having a really good day, but the fear was creeping in. I have long been plagued by visits from a voice that tells me I’m not good enough, particularly as a runner. Once the final alarm went off, I forced myself up and at em, and silenced the voice in favor of getting all of my gear on without forgetting anything. Let’s take a moment to talk about gear. I love how people always say that running is the best because all you need are shoes. Well, not me. I needed Body Glide and Kinesio tape, electrolyte chews and my heart monitor, my hydration pack, my shoes, you name it. 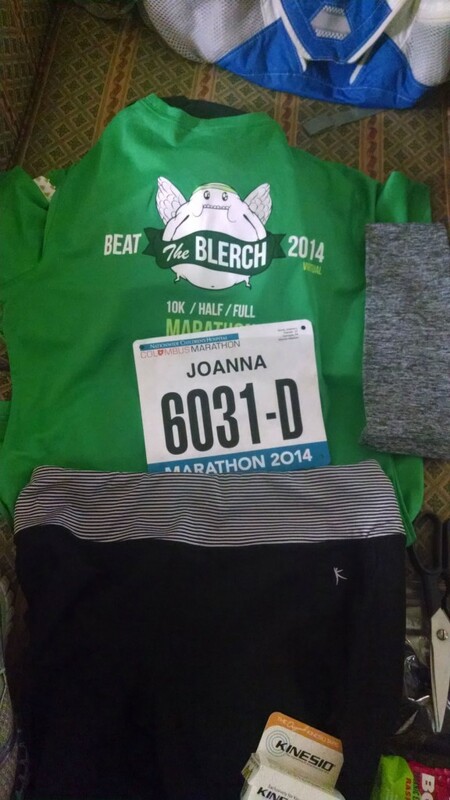 I wore Walmart capris, my Beat the Blerch race t-shirt, and some arm warmers that turned out to be amazing by Oiselle. I basically wear Walmart and Target running gear, unless I wear a race shirt. I can’t afford LuLu pants or Athleta jackets. But the arm warmers were a last minute Amazon Prime purchase when I realized I would need covered arms, but didn’t want the heat of a second layer. And now I know why people like Oiselle stuff. They were amazing. That brings us to the start line. Mark and our other friend A were biking the spectator route, so they left a bit later. The four of us that were running, took a brisk morning shuffle through downtown Columbus to get to North Bank Park and our corrals. The only really hard part about that was the full court press of the crowds as the corrals were closing, it still being basically dark outside. Oh and the fact that I was really nervous. I really tried to just think about it as another race and to not be thinking about mile 26 so early. From our view in D corral, we could see the fireworks during the national anthem and the gun start for wheelchair athletes. Pretty amazing, actually. I was super impressed at the fireworks, but only got a good photo of the smoke afterwards. They did it all again as the elites took off, and then for the “regular people”. Sadly, by the time D corral moved into place, the fireworks were over, but the DJ was still blasting music. I threw off my Goodwill hoodie, and we were off. The journey of 26.2 miles really does start with one step. If there had been a camera at the start line, I know it would have captured a smile on my face. We knew Mark and A were aiming to be somewhere around mile 8, so we enjoyed just tooling along, checking in on our pace every so often to make sure we weren’t pushing it too fast, too soon, due to being so excited and amped. This race is sponsored by the Nationwide Children’s Hospital in Columbus, and each mile has a patient champion. 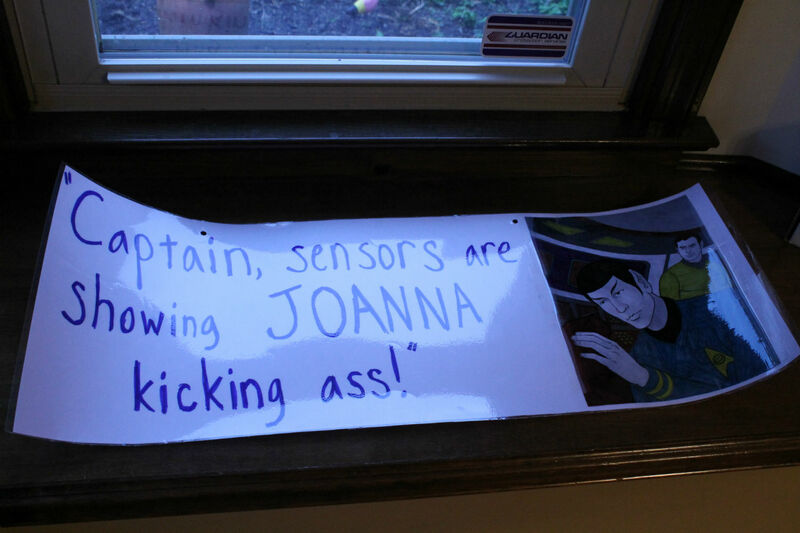 They had a cheer station with their families for each mile, plus signs along the way with their photos and fun facts. Those were not only a great distraction, but a great reminder of how privileged we were to be running the race in the first place. My favorite was a little girl who wanted to be a number of things when she grew up, including a wheelchair dancer. I don’t remember much specifically about those early miles, because I was just having a great time, looking at signs and hearing the spectators, checking out the lovely Columbus neighborhoods we ran through. When we got to 8.5 and saw Mark and A, we freaked out and ran over. Mark had made these surprise signs that he laminated and attached to the front of his bike at each stop, so he could use his hands to take photos but still have a sign up. 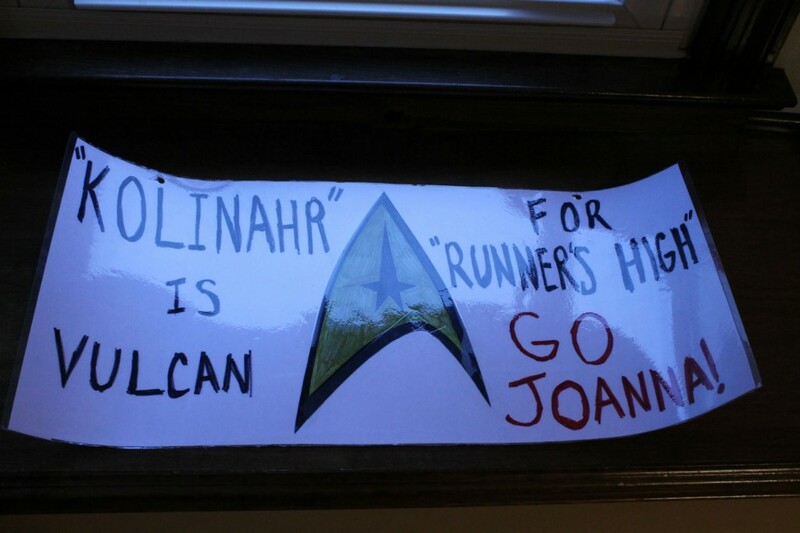 He had three during the race, and they were all Star Trek themed. Anyhow, the enjoyable miles just kept ticking by. By the time we got to the split, where the half marathoners went to the left to finish and we continued forward, we were talking with each other about how exciting it was to continue instead of turning to finish. As we ran along downtown, we remarked at how well it was all going and realized that we were actually having fun. 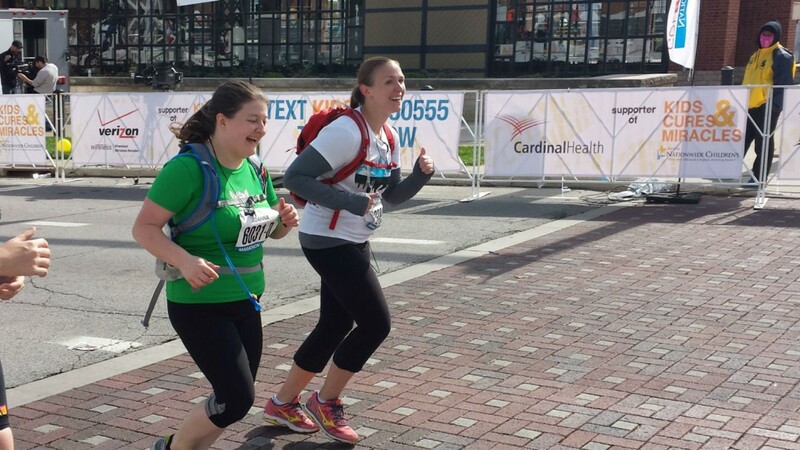 After a marathon training season that was very much not fun and for me, a meh racing season, this section of the race through the Short North was amazing. But we were suddenly very alone, the larger groups of runners we were with all turning to finish the half. I think it was somewhere around miles 15 and 16 that I realized that when you’re a back of the packer doing a marathon, your field isn’t huge. And as your field decreases, spectators do too. So I will be eternally grateful to the spectators that stuck it out to keep cheering. Because this is around when my legs really started to feel what they were doing. My left leg started to bother me, which is odd, since I usually have problems with my right. It started to get stiff and sore, but we pressed on through the OSU campus on our way to the stadium. And right before we got to the stadium, my left calf twisted and cramped, bringing me to a halt. I stretched it out and walked for a bit and made it into the stadium, which was a really cool experience, especially for someone who doesn’t care about football. We heard marching band music playing and kind of wished the OSU band was waiting on the field, but it was a recording. Just as soon as we got to the stadium, we were back out again and headed for mile 17. Somewhere in here, we found an aid station with food, and I grabbed two orange wedges like they were manna from heaven and shoved them in my face like a ravenous wolf. The juice was running all over, and I recall someone saying it would make a good photo. I was really happy to get to Mark and A again just before mile 18, and so appreciative that they made it, since this was the farthest point on the course for them to get to. I can’t understate how much seeing Mark every so often helped me. Strangers cheering is awesome, but having someone there for you who knows you just amplifies that support. I started to really struggle with leg pain for the next 2 miles, and as I started to panic about my legs being crampy and tight and the voice inside wondered how I would get another 10K, my heart rate started to go up. Which as an asthmatic isn’t the best – it makes my chest clamp and tighten. My friend T turned around and told me not to panic – she knows it’s my tendency – so I put both my earbuds in and tried to focus. But the voices. Those negative voices. At mile 21, I started to really let them get the best of me and began walking more, escalating the leg pain and foot pain as everything started to seize and stiffen. I could barely hear my music, the voices were so loud. Deafening. You are so slow. You are too heavy to run marathons. You don’t know what you’re doing. You’re walking. You didn’t train well enough. You don’t belong out here. Everyone else is already done. You’re holding your friends back. If it weren’t for you, they would be having a better experience. My friends T and R essentially began mentally towing me at this point. I was running behind them, but they didn’t leave me behind. And this is where I tell you that you couldn’t ask for better friends than T and R. It’s a fact that they could have finished faster if they weren’t making sure we all finished together. But they were there for me silently and verbally coaching me forward when I had given up on myself. I don’t know how I could have finished without them, and that’s not hyperbole, either. Even though both of them would probably roll their eyes at this, I am blessed to have both of them in my life. We saw Mark and A in between 24 and 25, and I cried when I saw him and tried to kiss him quickly and move on. He knew I was hurting and struggling and he whispered encouragement in my ear and said he’d see me at the finish. Somehow 6 minutes at a time, 3 minutes at a time, 2 minutes at a time, we got to 26. And at 26, knowing there was just one more bend and two tenths of a mile left, we pressed on. Mark and A were in the spectator stands waiting for us and taking photos. We heard the announcer calling out names and I heard “Joanna Stone, Carnegie, Pennsylvania!” and threw my arms up in the air and ran across the finish line. Hat tip to A for taking this photo. And that’s T, an angel with a hydration pack instead of wings. After the finish line (where I recall shriek screaming, though I have no idea why), we were given our medal and space blankets by smiling volunteers. The volunteer who gave me my blanket and taped it shut for me congratulated me and I told her she made me feel like a queen, slinging that foil around my shoulders. We moved over to the side of the chute to immediately stretch because our legs were all in pretty rough shape. That’s what happens when you run for 5:52. My chip time was 5:56:24, so I’m counting that as my time, but that included 3 toilet breaks, so we were actually a wee bit faster. After our finish photos, we grabbed our food bags and hobbled out to meet S, our friend who ran the half, and the boys. I recall hugging Mark so tightly and trying not to cry again. I shoved some disgusting potato chips in my face and a bottle of water and slumped at a table. One advantage of taking so long to finish is that the festival is pretty well cleared out by the time you’re done, so there’s lot of seating and no problems finding your family. This left the PR gong ready for me to give it a whack. And then we hobbled as far as we could before we couldn’t walk anymore, and the boys returned on their bikes to the hotel to get a vehicle to pick us up. And it was over. I can sit here now that it’s over and we’re home and be proud of myself – for the commitment I made to training, even when I really hated it. For pushing myself to the limits of what my body could handle – my body with all of its imperfections that still made it over 26.2 miles. I can also be fine with a race that showed the whole spectrum of what running can be – from the highest high to the lowest low. The #roadtocolumbus took 6 months to travel. At the end of that road, I can call myself a marathoner. 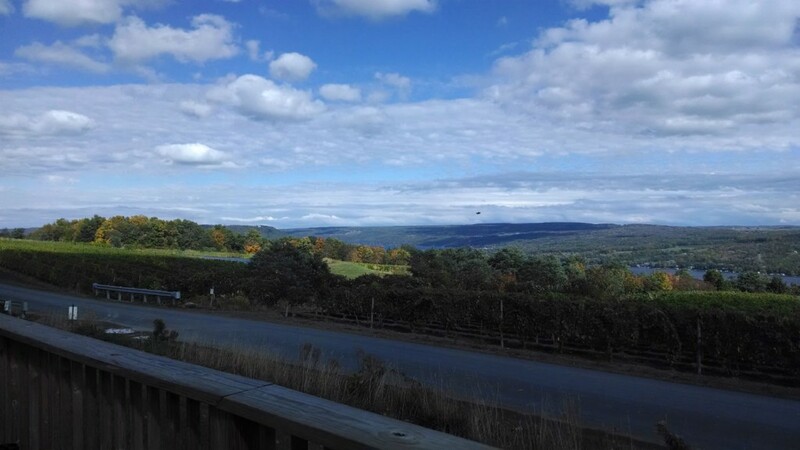 This weekend, I traveled with four other ladies to the southern Finger Lakes for the Wine Glass race weekend in Corning, New York. After some not so great race experiences this summer and the ups and downs of marathon training, I was really ready for a nice, solid race. And the Wine Glass Half delivered! The weather was frigid when we started – in the low 30s. I didn’t bring my running gloves or any warmer gear than capris and a long sleeve tech tee, so standing out at the start line was pretty cold. As a point to point course, the half marathon people started halfway down the marathon course, basically next to a giant corn field in the middle of nowhere, but with a lovely view. With the arrival of fall, the leaves were all turning and pretty much the entire weekend we all kept repeating “wow, look at this view” everywhere we went. Once the gun went off, like any race, the start was pretty crowded. There were no corrals or separations based on estimated time beyond the pacers, so it was a free for all. I started off a little too fast, though it also warmed me up enough that I was comfortable pretty soon. I settled into the pace I wanted to run the whole race – not fast enough to PR, but a solid time for the type of training I’ve been doing this summer. I tried to be really present in the moment of the race, take in the scenery and be especially grateful for legs to run and how far I’ve come in training that I am able to casually run a half marathon with no nervous stomach or anxiety. I passed some beautiful horses, some pastures of cows (how much of a country girl at heart am I that I loved that I smelled cows TWICE during a road race?) and several farms. The course also went through some residential areas and a park, and was mostly flat. It was an interesting combination of rural race and road race. Around mile 8, my phone decided to reboot itself, losing my music and my GPS that was giving me my paces. So instead of “pulling over” and fussing with my phone, I just turned the music back on and finished the rest of the race without the GPS. Which in a way was quite freeing – just running by feel. But on the other hand, it made me lose time in those last 5 miles, because I finished with a lower average pace than I was carrying for those first 8. For a rural area, I was surprised at the number of spectators and signs along the course, which I’m sure was especially nice for the marathoners. I love a good “No Time for Walken” sign with Christopher Walken’s face on it. Like I said before, I was really ready for a good race. I was looking for that feeling I had when I raced last year – the excitement you get in the pit of your stomach when you round a final bend and see the finish, or when you realize right in the middle of the run how happy you are. This year’s running has mostly been challenge, with a distinct lack of actual fun. But coming across the final bridge in this half marathon, seeing the spectators increase and knowing the finish line was close, I finally got that feeling – the high that people talk about. For me it’s not a feeling of invincibility, but just a swell of happiness and pride in myself. A man who had finished the race was walking back along the course and looked at me and shouted “YOU LOOK SO STRONG! GO GET IT!” and I could have high-fived the guy. I bolted for the finish in the last half mile – just all-out emptied the gas tank. I shouted something unintelligible at my friends who were spectating and just drove forward. I saw the time on the clock, knowing it was solid for where I’m at right now and was really pleased. It’s a great feeling to run across a finish line to cheers, knowing you gave yourself a solid performance. In the chute after the finish line, we got our glass medals (Corning is known for its amazing glass) and headed to the most amazing post-race food line I’ve ever seen. Not only were we given a bag to collect our goodies, but we got water and chocolate milk, apples, cheese sticks, cookies, bagels, bananas and the kicker – hot chicken noodle soup and fresh pizza. That they were making right there! In the finish chute! I eagerly stowed the snack stuff in the bag an grabbed the soup and pizza and wolfed them down, sitting on the side of the road shivering on a spaceman blanket (the foil wraps they give you post-race when it’s cold). I thought I took a picture of them, but apparently I was too delirious with the delicious salt food in front of me. All in all, it was a great race. The swag bags were solid too – we got a bag, a long-sleeve tech tee, plus a wine glass and mini bottle of champagne. All of the volunteers were very friendly and helpful. I feel like they treated the runners like royalty – and so did the town. The people we encountered in the shops and restaurants were all friendly and welcoming to runners – many of them having special displays or discounts for runners and spectators. Some of the restaurants opened at 5 a.m. to accommodate spectators, which was pretty nice considering the frigid cold outside. I’d definitely come back to the area again – both to race and to visit. 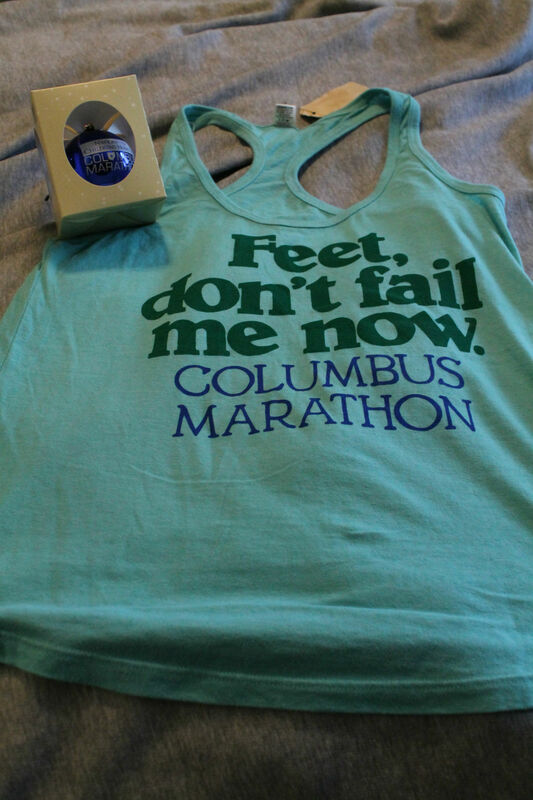 A good choice for a race during the taper, because it finally has me feeling something about Columbus – both excitement and nerves – the combination that I hope will propel me the last 6 miles over the finish in less than two weeks! It’s kind of absurd that for as close as we live to West Virginia, we rarely visit. It’s true – often it takes me longer to get to work than it does to get to West Virginia. But we spent last Saturday there and it lives up to its motto – Wild and Wonderful. We have a Stone tradition of taking our birthdays off of work and spending the day just the two of us, doing whatever activities the birthday person wants to do. But because we were just on vacation, we opted to celebrate Mark’s birthday with our outing on a weekend. And he couldn’t decide what he wanted to do, so he asked me to surprise him. 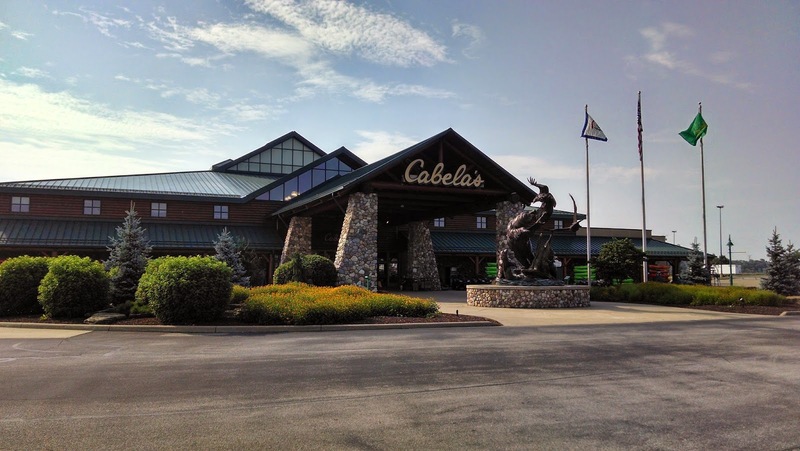 Our first stop was Cabela’s in Tridelphia/Wheeling. Mark’s wanted to visit this hunting and fishing paradise store for ages, and we’ve passed it a few times on the way to Oglebay or to Lake Cumberland and he’s looked longingly out the window. So we finally went. Hoo boy. Yeah, it was a veritable museum. I’ll admit, there was definitely some cool merchandise and plenty that would interest Mark as someone who likes to hunt and fish and be outdoors. Though this was taking it a bit too far. 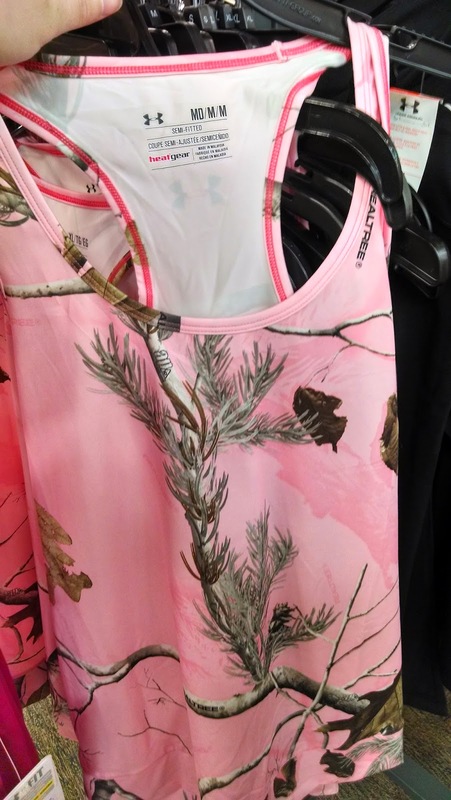 Under Armour pink camo running tank? Yeah, no. 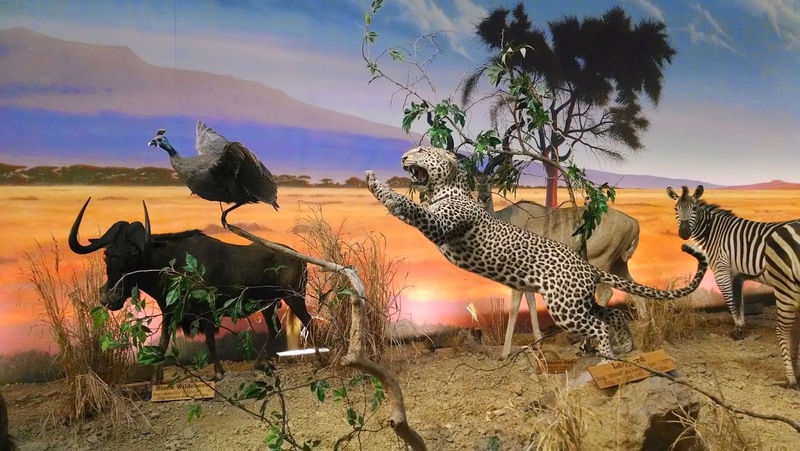 From Cabela’s it was on to Moundsville to tour the former West Virginia Penitentiary. This place looked like a fortress, and that’s basically what it was until it closed in 1995. Our tour guide was a former guard and he wasn’t too convinced about the stories of it being haunted. For me, there wasn’t anything more creepy than the fact that this place actually housed human beings less than 20 years ago. It’s a tour worth taking for the interesting (and creepy) history of the place, though I wouldn’t go so far as to do what the ghost hunter shows do and stay overnight in the place (which apparently the general public can do too). I’ll spare you more photos of rusty toilets and peeling paint, but let’s just say it was easy to see where WV tax dollars did NOT go. We followed up the tour with a picnic in the shade at Grand Vue Park nearby. Mark and I had never actually had a picnic before in all the years we’ve been together, so this was a nice change of pace. But man was it hot. After the picnic we tried geocaching for awhile but mostly managed to traipse through a lot of weeds and get frustrated. Good thing we’ll get to learn more about geocaching at the Venture Outdoors membership event on Sunday. Due to the heat making us wilt, we skipped the zip line and mini golf they have at the park and headed back home to watch the original Planet of the Apes and eat pizza. We’ll definitely be making more day trips to West Virginia – and can’t wait to go back to Grand Vue Park in the fall, with proper hiking gear and another picnic lunch! 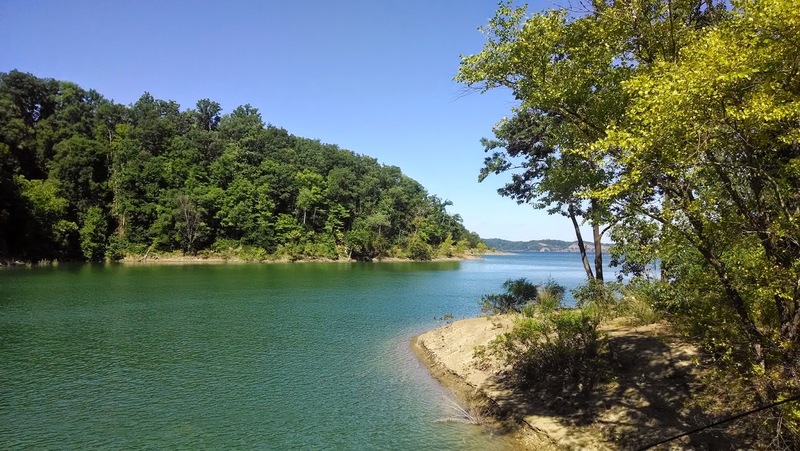 After a completely crazy week leading up to it, we took a few days of much needed vacation last week and headed off to Lake Cumberland in Kentucky. We were there for just under 4 days and I was reluctant to leave. I’m still in denial that vacation is over. I mean, who wouldn’t, if you spent a few days waking up to this? We rented a house boat with 6 other friends and spent our time tooling around the most gorgeous lake I’ve ever seen in weather that couldn’t have been better. No rain the entire time we were there, and sunny skies with low humidity. Probably the best part about this vacation was how much of an actual vacation it was. Having a few days off of the internet and not using my phone was nice. I posted a few photos to Instagram, fully intending to record the vacation that way. But after the first sunrise I saw, I turned the phone off and forgot about it. We didn’t even know what time it actually was most days, since we were in and out of time zones, bouncing back and forth between Eastern and Central. I read several books, got some sun, swam in the lake and even jumped off the top deck of the boat a few times. Mark and one of our friends got to fish, but they released what they caught since none of them were “legal” size. Each night we moored in a different cove and got to watch the sun set on the lake. While I’ll mostly be back to regularly scheduled programming this week, I know my thoughts will likely often be at the lake. (It’s taken me a couple of days to realize I’m not on a boat when I wake up in the night and think I’m swaying.) The houseboat was a fantastic idea and we are highly likely to go back. My preference would be tomorrow. 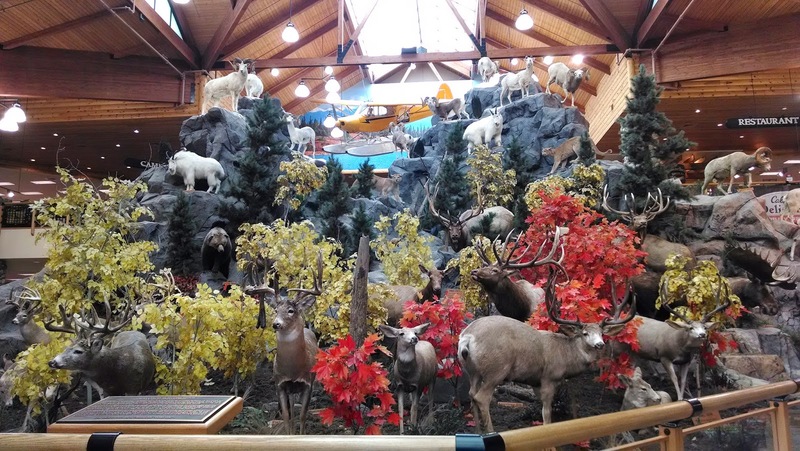 For the third year in a row, we headed to Seven Springs for the Mother Earth News Fair (MENF). The best way I can describe it is a giant convention and vendor fair for sustainable living. Vendors showcase everything from farming equipment to handmade soaps and workshops are offered for just about all things under the sun – from classes about livestock to home fermentation. We have found something new to learn and discover each year, and the fair gets bigger and bigger. This year, I went to workshops on chickens in gardens (and how they can peacefully co-exist), home fermentation, building a real foods pantry and foraging for wild foods. A wicked storm moved in on Saturday and when we were soaked and freezing, we skipped an afternoon of workshops to get dry and warm. But otherwise? Awesome. In particular, the class on lactofermentation inspired me to finally get off my duff and get my kombucha (fermented tea) going at home. Mark had given me all the tools to get started for a gift one year – including a SCOBY – so I don’t know what’s been holding me back from starting. Someone at one of the workshops mentioned that you can’t be afraid to be a beginner. I think it’s given me enough push to get started! Mark and I laugh that we both leave the MENF each year and want to quit our jobs and move off grid into a cabin in the woods and raise some goats. While that’s not in our immediate future, it’s nice to come away refreshed and with new ideas on how to live more sustainably. 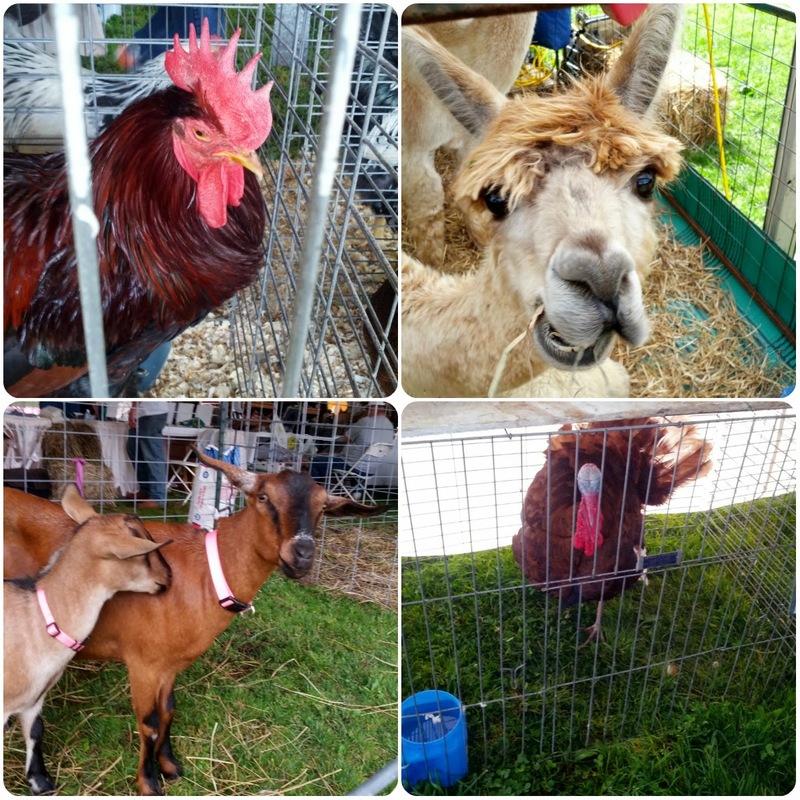 One of my favorite parts of the fair is the presence of all manner of animals. If you follow me on Instagram (@nextgenhouse), you might have seen these guys. 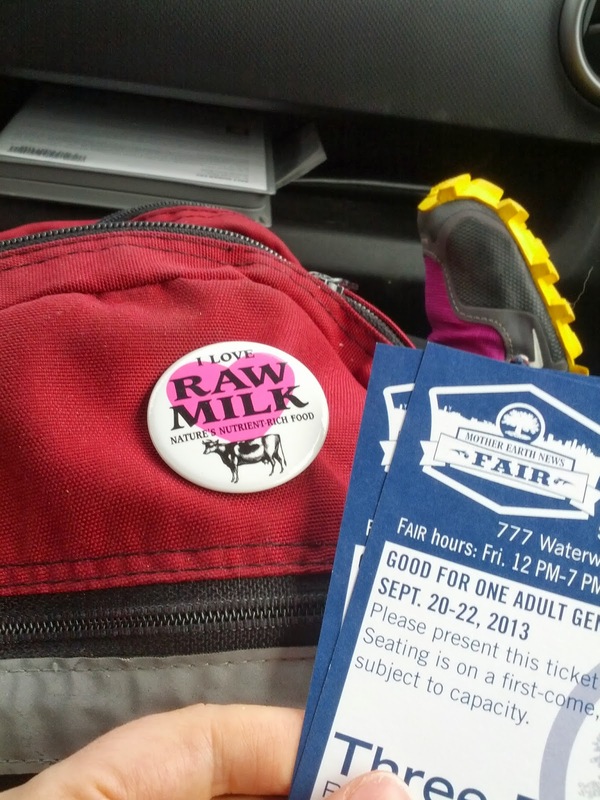 Seven Springs doesn’t offer much in the way of good food options for this fair, which is the only down-side. Particularly at a conference about sustainability, I don’t want to eat commercially raised meat or rock-hard, out of season vegetables. Thankfully there were a few vendors that had some good snack options – and one local food truck in particular that had good meal options – Randita’s Grill. It’s no secret that we aren’t vegans by any stretch of the imagination, so I was a bit hesitant to try out a vegan food truck. I guess in my head I was expecting creepy textured vegetable protein, but I ended up having a great chili and a fantastic salad that was fresh and delicious (with figs! so yum! ), a sharp contrast to the processed commercial offerings at the main food area. (The main food area had a mashed potato martini bar. I mean, seriously. Ew.) I was impressed by the food from Randita’s – and also how the people in the truck kept their cool despite a ridiculously long line and pouring rain. I’m adding their restaurant in Saxonburg to my list of places to try! 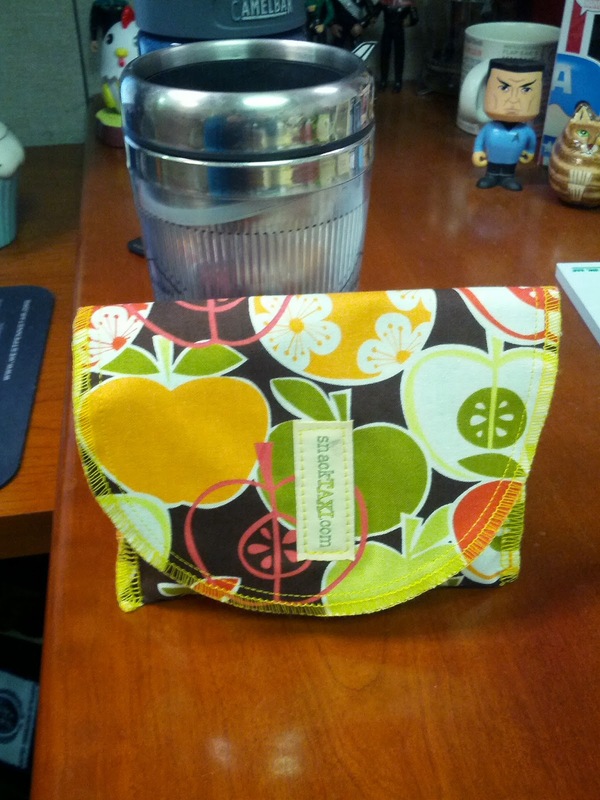 Snack Taxi – I bought two reusable snack bags for my lunch and thus far they’ve been working out fantastically. I am working on reducing consumption of plastic bags, so my two Snack Taxi bags have already saved me almost 20 bags! Plus it looks cute too. St. Lynn’s Press – Pittsburgh publisher of some great gardening books, including some by local authors. We picked up Good Bug, Bad Bug to help us with pest ID. They’ll be publishing The Steel City Garden: creating a one-of-a-kind garden in black and gold by Doug Oster in the fall, which looks to be awesomely Burghy! Might be an idea for our front yard flower area. Gourmet Grassfed – I had my first ever beef jerky from Gourmet Grassfed and holy cow (no pun intended), was I surprised at how delicious it was. We bought some jerky and beef sticks – they’ll be perfect for Mark to take out in the woods when he’s hunting all day. Farm Fromage – Fantastic raw milk cheese from PA farms. I had a mushroom and leek jack cheese which was amazingly bizarre but delicious. Singer Farm Naturals – producer of some delicious cherry juice concentrate. We picked some up to mix with soda water as a yummy drink, but I’m also interested in its use as a recovery drink for running after seeing a blurb about it in an issue of Runners World. We recently visited friends in Virginia, and while doing some things in D.C., we stopped in to the Smithsonian National Museum of American History. In particular, we wanted to see Julia Child’s kitchen. I’ve seen it before, but it’s so special, I could see it again and again and notice something new every time. This time I was pleasantly surprised to see that it was part of a larger exhibit called FOOD: Transforming the American Table 1950-2000. The exhibit started off by talking about how the last half of the 20th century was an incredibly transformative time for food in America – not only what we eat, but how we get our food, how we eat it, and what it means culturally. The centerpiece of the exhibit was a large table where people could sit and talk. There were discs of information on the table that functioned like lazy susans and were conversation starters. I was really excited to come across an old copy of Mother Earth News in a display about progressive food movements. I’m a subscriber today to the same magazine! The entire exhibit was fascinating, and also was beautifully designed. I wanted to read every caption (and dream of making it back there before the exhibit closes). 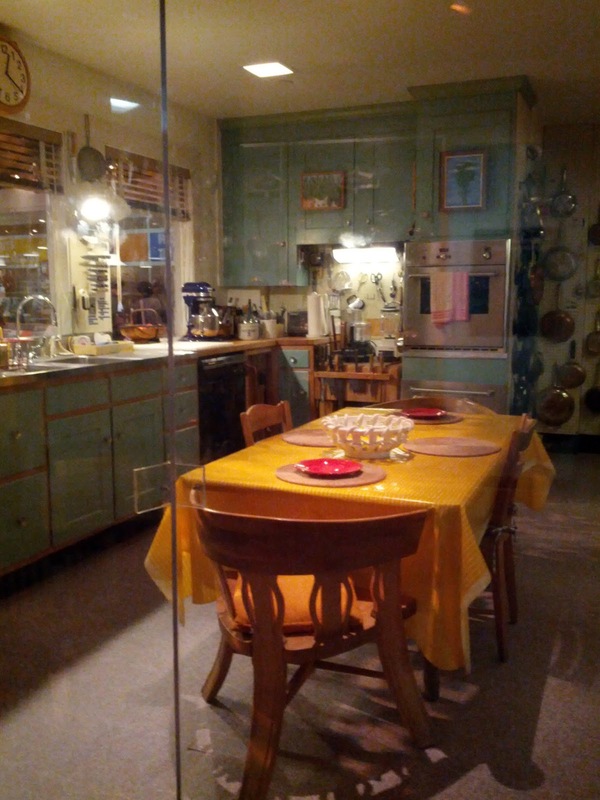 Of course the real highlight of the exhibit is Julia Child’s kitchen, which is a reconstruction of her own home kitchen in Cambridge, Massachusetts. Paul Child, her husband, had the counters specially designed to accommodate her height, and created the pegboards that held her pans, complete with outlines. I’ve always been a fan of Julia – I’ve read a lot of books on her life, as well as her own books. One year I was Julia for Halloween (albeit a 4’11” version of her). 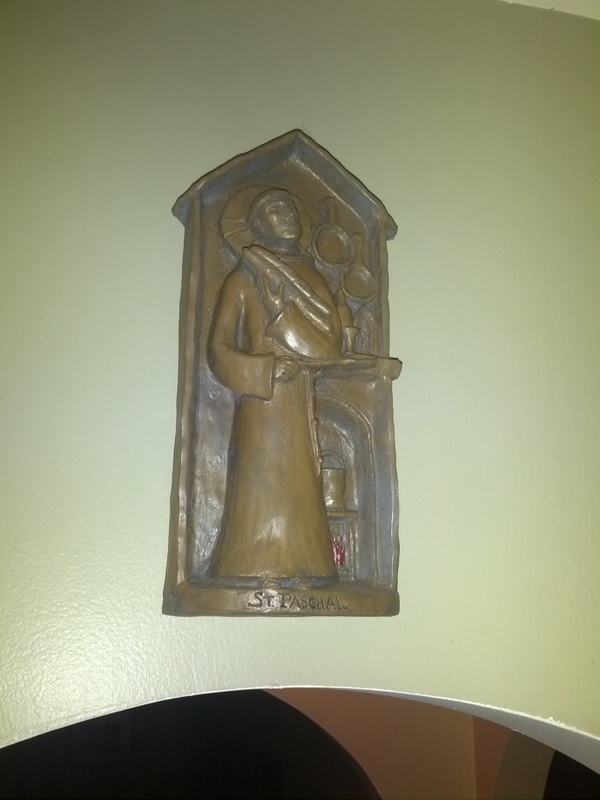 During our first visit to the Smithsonian exhibit, Mark noticed the saint hanging on the pegboard with her cookware. If you take joy in cooking like I do or you enjoy eating foreign foods, you probably owe some of that to Julia Child’s legacy. She made cooking outside of the box accessible to Americans with an infectious enthusiasm. She encouraged people to be fearless in the kitchen and try things they would never have considered. Check out episodes of “The French Chef” if you get the chance. In a world with glorified cooking shows that make everything seem glamorous and easy in the kitchen and food stylists manipulating meals to make your mouth water, it’s gratifying to watch Julia drop things on the floor and make a royal mess. I especially enjoy the episode where she flops a giant fish onto her counter. Make it a point to see this exhibit when you’re in the D.C. area! 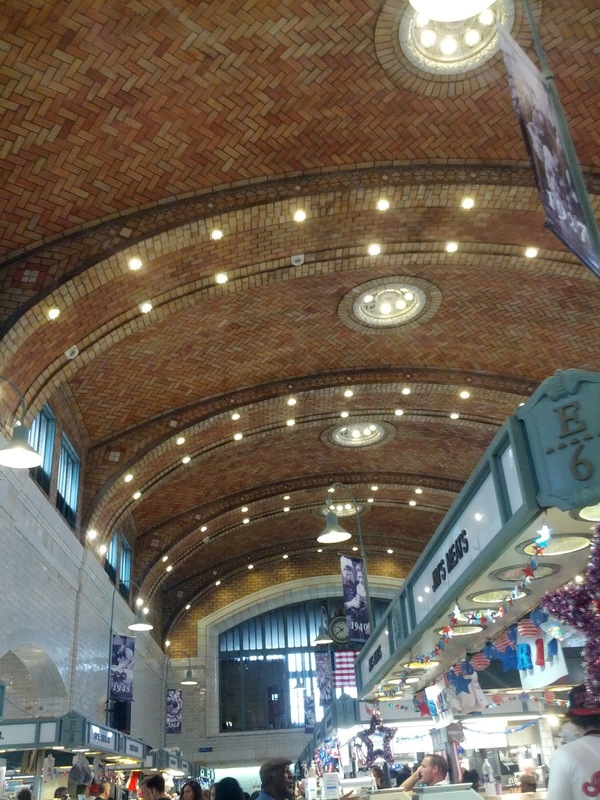 We spent Saturday in Cleveland visiting family and friends, and made it to the West Side Market, the city’s oldest publicly owned market. It started back in 1840 and in 1912 was housed in its yellow market building, where it still exists and thrives today. 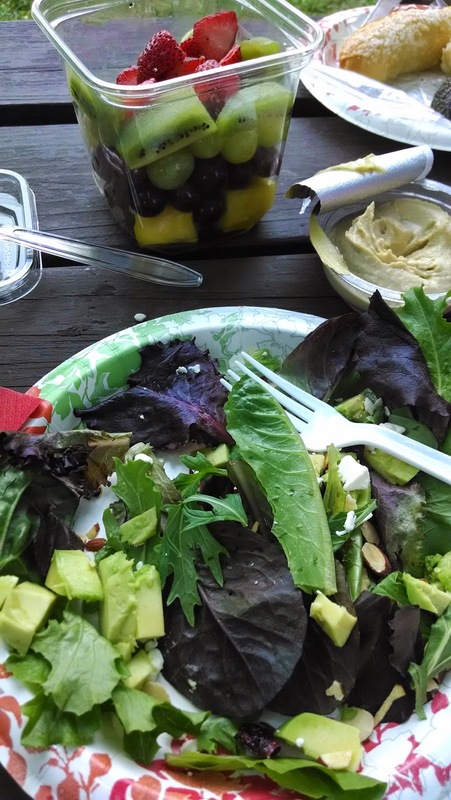 We ended up with some salad greens, as well as the aforementioned melon and some other fruit. My photos aren’t the greatest – it was a cloudy day and I was using my cell phone inside the market. And also holding bags of fruit. 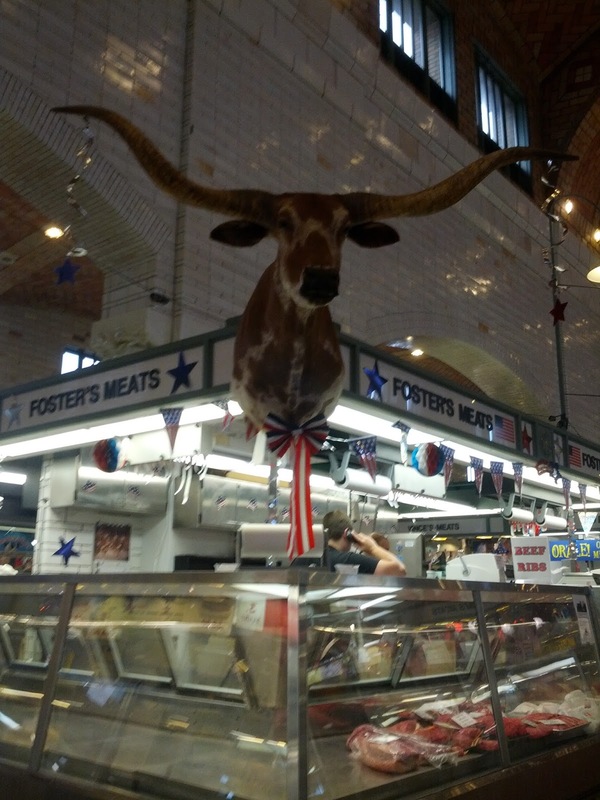 Lots of meat places with many cuts and specialty items. I hope that over time the market gets more vendors using locally raised meats and grass-fed items. Earlier in the day we had eaten lunch at Noodlecat, a ramen restaurant and one of our favorite restaurants in Cleveland. (Home of the most amazing brussels sprouts dish that you could ever dream of. Thanks to Noodlecat for making them for us at lunch even though they are on the dinner menu!) 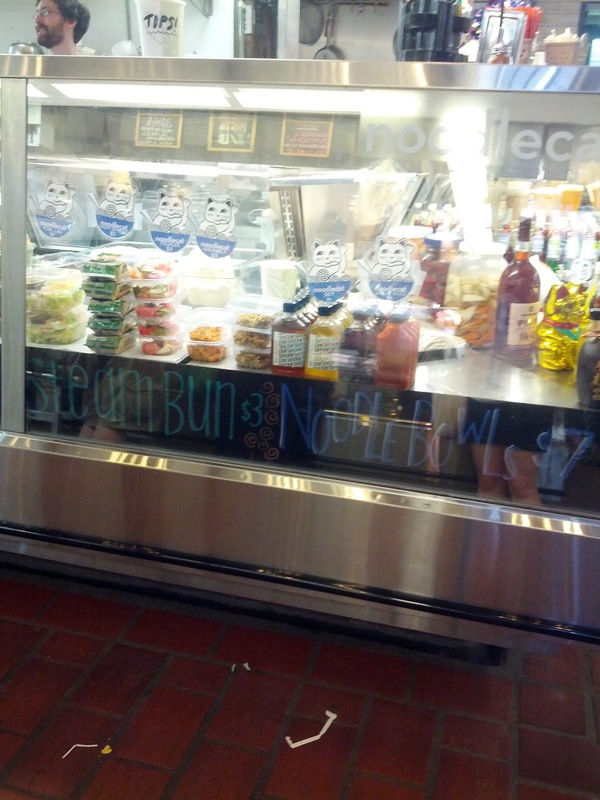 We discovered that they also have a stall at the West Side Market! 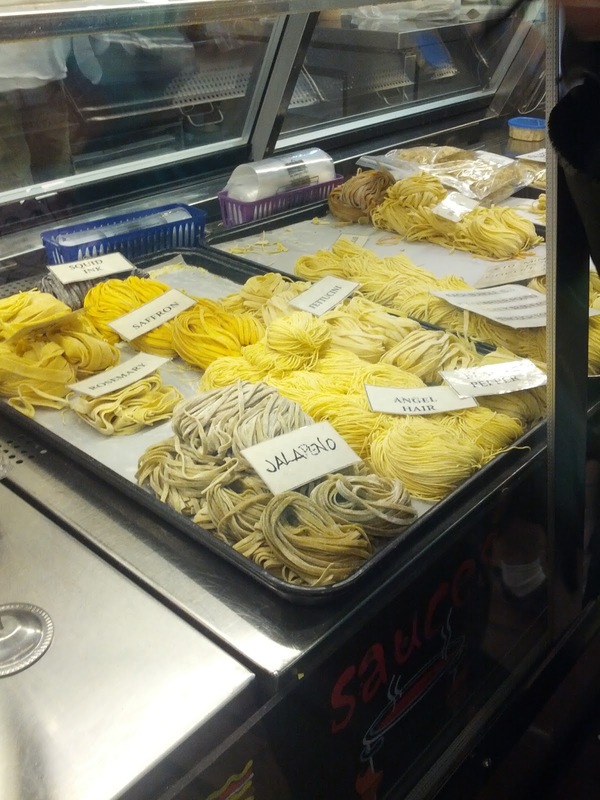 We also came home with some papardelle from Ohio City Pasta. It’s hard not to put your hands all over the case and press your nose up to it, the pasta looks so good. They also have tons of homemade ravioli that were tempting too. Mark and I also gave into our favorites – Campbell’s Sweets Factory White Cheddar Dichotomy Popcorn for me, and a cupcake from Grandma Campbell’s for him. After the Market, Mark met some friends and I met his sister for dinner, and because both of the places we had originally intended to go had crazy long waits, we both ended up at the same place without knowing it until we arrived: Market Garden Brewery and Distillery. This is a shot of the back of the restaurant – where you can see the stills. 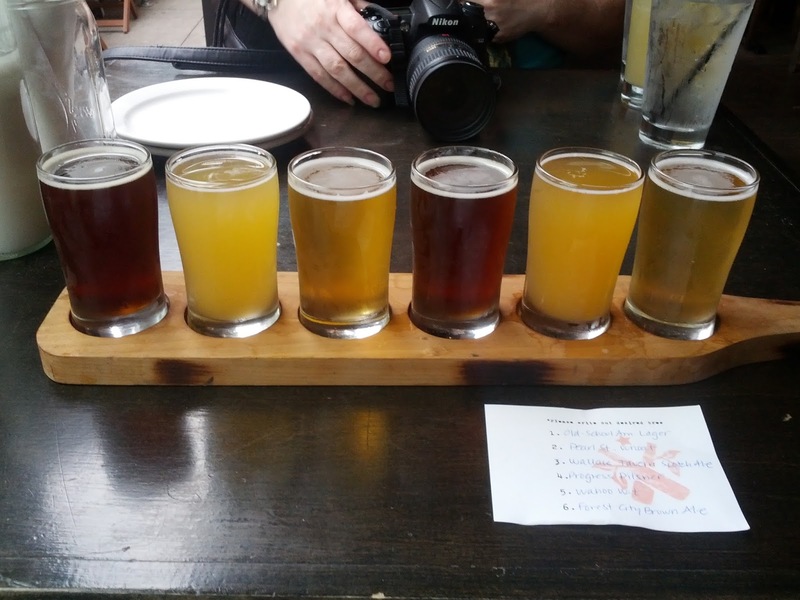 Food was good, but the beer sampler was the best. I got to choose 6 of their own beers to taste. I was really happy to be able to fill 6 without having a stout or an IPA in the list. I loved them all, but the All-American Lager was my favorite (far right). Had I had some forethought, I would have taken a growler or a growlerette home. I just love craft beers, especially having them at the same place where they are brewed. We also drove by several urban farms yesterday that have popped up in Cleveland within the last year or two, which is really great. 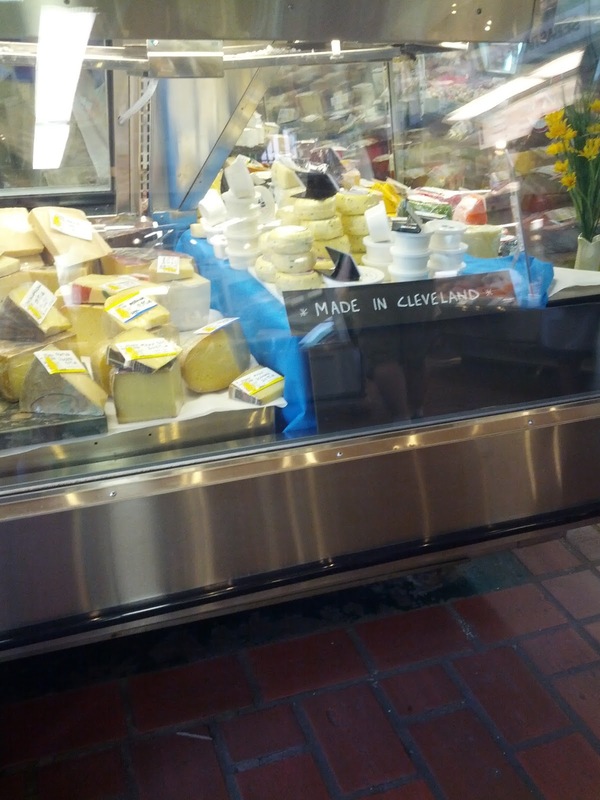 I’d like to check out the Ohio City Farm Stand next time we’re there – it was purple!